The movie was scheduled to have a premiere screening on December 15, 2012. The Sandy Hook shooting took place on December 14. Out of respect for the families of the victims, Paramount Pictures postponed the premiere as the opening scene of the film involves a sniper randomly shooting five people. The movie opened on December 21. Considering Sandy Hook, I looked at the film with a different eye. That eye saw violence and lots of it. That eye saw the American culture steeped in the mystic of the lone cowboy righting wrongs and bringing hell and damnation to the bad guys. That eye saw something so pervasive in the United States that I do wonder if a fish knows it's living in a fishbowl. Okay, this is supposed to be a movie review so I'll save my rant for another time. 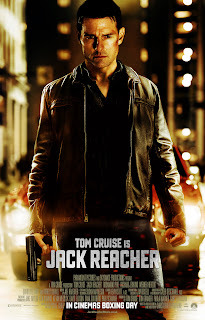 Jack Reacher is the fictional character of a series of novels by the British author Lee Child (pen name of Jim Grant). He is described as 6' 5" tall (1.96m) with a 50-inch chest with a weight between 210 and 250 pounds (100–115 kg). Tom Cruise is 5'7" (1.70m) and weighs 170 lbs. (77 kg). (Tom stats) If there is one thing the fans of the novels seem to have taken exception to, it's such a diminutive actor in the title role. On the other hand, Arnold, as in Schwarzenegger (like I needed to say), clocks in 6' 2" (1.88m) and 260 lbs (113 kg) (Arnie stats) more in keeping with the description of the Reacher character but let's not forget that Arnie is 65 years old. Reacher was supposedly born in 1960 which would make him 53 right now. Just a few random facts about the fictional and the real to get off the table right up front. Good movie? Bad movie? I rate it as an okay middle of the road quality film. Been there, seen that. Considering its 62% rating on Rotten Tomatoes, this one is squeaking by. Yes we have a murder mystery that the lead character must solve but this involves the lead character going through a number of bad guys to get to the head bad guy to ultimately solve that original mystery. It's this part of the proceedings I would classify as gratuitous violence as opposed to good detective work. Tom Cruise has morphed into an action hero of sorts so this outing should come as no surprise. Cruise isn't physically big so it's interesting how camera angles can do wonders to make our little big star come across as larger than life. In the final analysis, going to see the film probably has more to do with being a fan of Tom Cruise than anything else. The film over all is professionally made but the results are just so-so. I am sure there are many other offerings out there worthy of your hard-earned cash so I would recommend you choose wisely and wait until this one turns up on TV and even then, I would warn you to treat this as a curiosity as opposed to an excellent way to waste two hours. I think Tom's next film Oblivion (see link below) looks more interesting. Ha! How good is Jack Reacher? I'm previewing another film in this review! Ha! Jack Reacher is an above-average crime thriller with a smoothly charismatic performance from Tom Cruise. 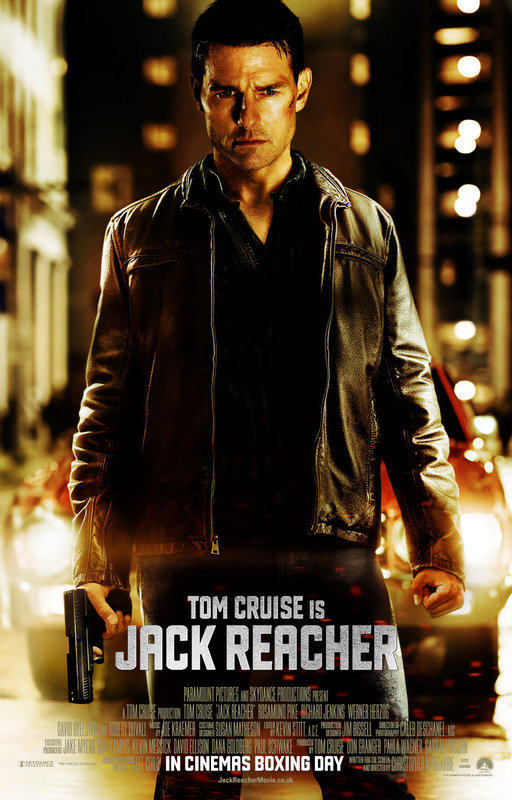 Jack Reacher (previously titled One Shot) is a 2012 American crime film. It is a adaptation of Lee Child's 2005 novel One Shot. Written and directed by Christopher McQuarrie, the film stars Tom Cruise as the title character. The film entered production in October 2011, and concluded in January 2012. It was filmed entirely on location in Pittsburgh, Pennsylvania. Jack Reacher is a fictional character created by British author Jim Grant (who writes under the pen name of Lee Child) and is the main character in 17 Books. from July 2010: Scientology, Tom Cruise, Oprah, South Park. This dates back a few years but a reference on a recent blog made me think of my own run-ins with Ron. This is not an exhaustive description or analysis of this so-called religion but merely my personal experiences. Oblivion is an upcoming science fiction thriller film based on the Radical Comics graphic novel Oblivion by Joseph Kosinski and directed and co-produced by Kosinski. It stars Tom Cruise, Olga Kurylenko, Andrea Riseborough, Morgan Freeman, Melissa Leo, Zoë Bell and Nikolaj Coster-Waldau. [The film is set to be released on] April 19, 2013. The film will be released exclusively in IMAX on April 12, 2013, one week ahead of its wide release. Tom Cruise Net Worth: Actor Tom Cruise is an American movie star who has starred in dozens of blockbusters and has net worth of $250 million.